007, a photo by jessicawetrust on Flickr. As there are only a few days left in 2013 I thought it would be a good time to sit back and reflect on the new year's resolutions made twelve months ago. I am actually rather impressed with myself as I've never actually made new year's resolutions before which I've made a conscious effort to keep all year. Firstly, I made the resolution to not to need to go on a diet this year and I can put a tick next to that one as my weight seems to have stayed pretty much the same all year. I can't put that down to healthy eating though - that is definitely something I need to work on in 2014. The next resolution was to read more and once again I did well. I have definitely read a hell of a lot more than I have done in previous years since becoming a parent. I mostly put that down to being able to read on my iPad and iPhone. I do try to read 'real' books whenever I can though. I also planned to have a good declutter this year and although there is still a long way to go I feel I have made a good dent in the clutter and I like it. Although I am a bit of a hoarder I do actually find getting rid of things really therapeutic. And finally was photography. I planned to focus a lot on that this year and I have. I have finally worked out where I want to go with this photography lark. Surprisingly I have decided I don't actually want to become a professional photographer. I just love taking pretty and interesting photos. I love my DSLR and my iPhone camera in equal measure. And I am completely sure that photography will remain a great passion of mine. So, all in all I think it's been a rather successful year resolution wise. I therefore have a planned a few more for 2014 which I will probably share with you in my next post. 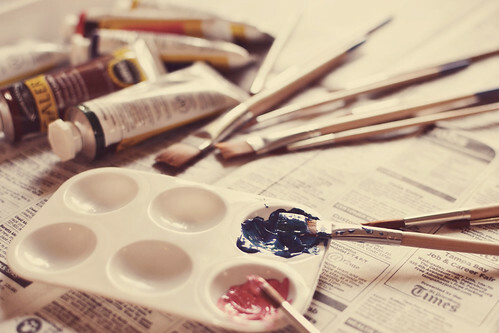 I searched for New Year's resolutions photos and came across this one that makes me want to take up painting. I love how the soft colours give the whole thing a really calm and peaceful feeling. I wish I could paint or draw but unfortunately I am rubbish at that. That's why I make pictures with the help of a camera. Hope you had a great Christmas and are enjoying the last few days of 2013.